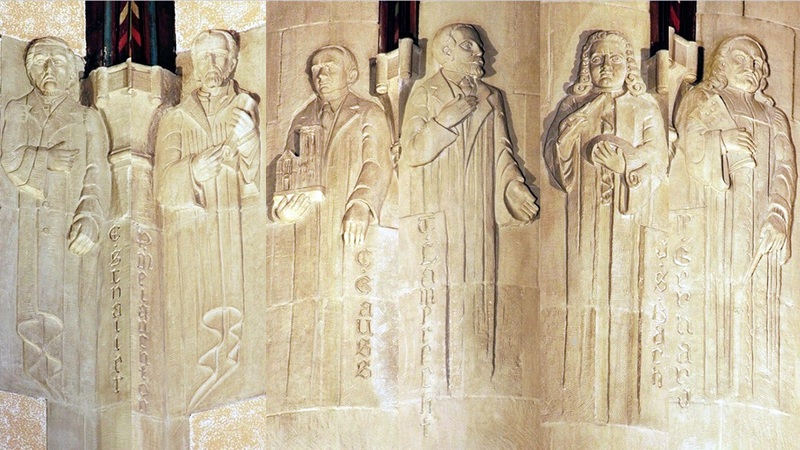 Dr. Walther is shown looking directly across the nave to the carving of Martin Luther because he is considered to be the Luther of America and founder of The Lutheran Church-Missouri Synod. Ludwig Harms began a great spiritual awakening in northern Germany and founded the Hermannsburg Mission. This mission trained pastors for foreign mission work and sent the first Lutheran missionaries to the United States, Africa and other countries. Frederic Wyneken “father of home missions in the Lutheran Church-Missouri Synod”, was also one of the triumvirates like Walther, Wyneken and Sihler, that associated in the founding and building of the Lutheran Church-Missouri Synod. Durer was a German artist, engraver and a contemporary of Martin Luther. He studied with Michael Wohlgemut, a painter, and traveled extensively, going to Italy in 1949. His encounter with the classic spirit in Italy was particularly important. Hans Holbein, the younger German artist, the son and pupil of Hans Holbein the Elder, was born in 1947 at Augsburg. Around 1515 he left Augsburg for Basel, where he worked as a book illustrator, portrait painter, and mural painter. John Buenger was born January 2, 1810 at Etzdord, near Rosswein, Saxony, Germany. He is a descendent of a family of clerics reaching back to the Reformation. August Francke was a German philanthropist, preacher, educator and leader in the pietistic movement. Influenced by Philip Spener, the foremost Representative of Diestism, Francke and Paul Anton organized in Leipzig the Collegia Biblia calling for closer devotional bible study. H.C.F. Otte came to the United States with his parents at the age of 9, having been born in Hanover, Germany. He served as a pastor in a church in Minneapolis when he was called as assistant pastor to Reverend J.A. Huegli, whose health was failing. John Huegli was born in Palatinate, Germany. He came to the United States at the age of 11 years on a ship that took 33 days to make the crossing. He had early decided he wanted to be a farmer, but was persuaded by his pastor to study for the ministry. William Dau was born February 8, 1864 at Lauenburg, Pomerania, Germany. He came to the United States with his parents in 1881. When he was a young tailor’s apprentice, he was discovered by Reverend Huegli in his father’s tailor shop studying Latin. Pastor Huegli encouraged the young man to study for the ministry and the congregation supported the young Dau during his studies at Concordia Seminary in St. Louis, from which he graduated in 1892. 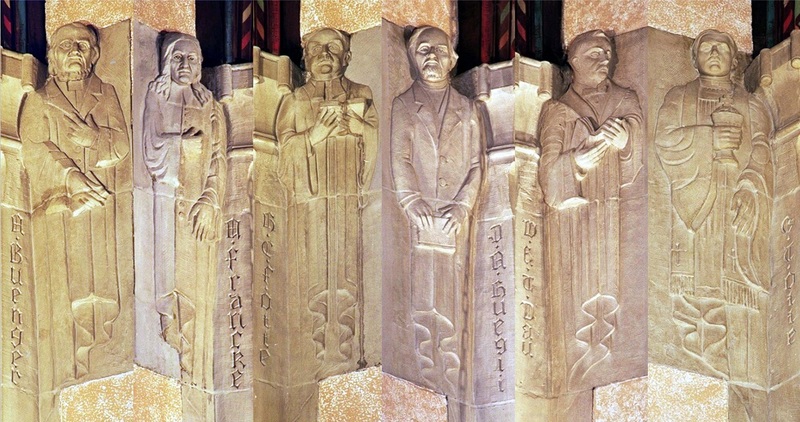 The statue of Dr. GT Otte was carved on site by the artist as Dr. Otte stood on a scaffold platform adjoining the block of stone high in the chancel. Dr. Gilbert Otte was born in the parsonage of Zion Lutheran Church, St. Paul, Minnesota on May 12, 1900 to the Reverend HCF Otte and his wife Martha, nee Plehn. Dr. Martin Luther was born Novemeber 10, 1484 in Eisleben, Germany. He died February 18, 1546 also at Eisleben. Dr. Luther was the father of Protestantism and founder of Lutheranism. John Wycliff was born in Yorkshire, England. He was a parish priest in a small town near Birmingham, England. Wycliffe attempted to reform the church in England by repeatedly opposing the pope’s meddling in English affairs of both state and church. 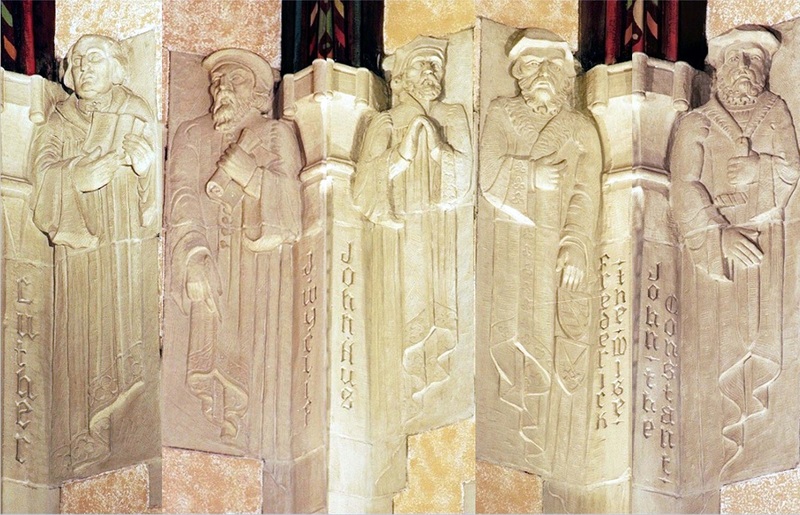 John Hus’s inability to accept the authority of the church where it went against his conscience and his understanding of Scripture, made him a forerunner of the Reformation and a martyr for the faith. A Slovak, he was born in 1370 at Husinec, Bohemia, Czechoslovakia, studied at the University of Prague, became a priest in 1400 and in 1402 made rector of the university and preacher at Bethlehem Chapel in Prague. Frederick III was Duke and Elector of Saxony 1486-1525. He never married but had two sons and a daughter by Anna Weller whom he loved deeply. He was a devout, if sometimes misled, Christian prince. John the Constant of Saxony ruled with his brother Frederick the Wise, and later by himself. The Elector remained constant to the Reformation against all attempts to draw him over Rome. Gottlieb Schaller, born February 12, 1819 at Kirchenlamitz, Bavaria, was confirmed and instructed in Latin by Pastor William Loehe. He attended the Gymnasium at Nuremberg and then studied theology at Erlangen where he graduated in 1842. Philip Melanchton, a German reformer and co-worker with Martin Luther in the Reformation, was born February 16, 1497 as Philip Schwartz at Bretton Baden. He completed his BA at Heidelberg and completed his MA at Tuebingen. He gained the accolades of Erasmus for his style and he became noteworthy in the circle of humanists. Charles Gauss was born in Germany and came to the United States in 1891. He began work washing dishes in a hotel on Monroe Avenue. In five years he had saved enough to open a wholesale tobacco store on Grand River, which developed into one of the largest establishments of its kind in the country. Theodore Lamprecht was born August 7, 1858 and died April 30, 1928. He was a Missouri Synod businessman (woolen industry), a churchman, and philanthropist. He was co-founder of the LLL (Lutheran Layman’s League) in 1917 and served as its president until 1926. He was also president of the American Lutheran Publicity Bureau, from 1920 until 1928. Johann S. Bach, the German composer, was born March 21, 1685. His father and grandfather were both musicians of distinction. Bach was the father of 20 children, seven by his first wife, Maria Barbara Bach, and 13 by his second wife, Anna Magdalena Wilcken. As a boy, Bach studied violin with his father and the clavichord with his brother, attended local schools and obtained instructions in the organ from Boehm. Paul Gerhardt is known as the Asaph of the Lutheran Church, the greatest hymn writer after Luther, whom he exceeds in flexibility of form and in smoothness of language. Gerhardt was born at Grafenhainichen, Saxony on March, 1607. After studying at Wittenberg and tutoring at Berlin until 1615, he accepted a pastorate at Mittelwalde, but in 1657 went to St. Nikolai Church in Berlin. Gabriel – The Archangel Gabriel, the announcing angel, is shown on the upper left hand side of the altar reredos. 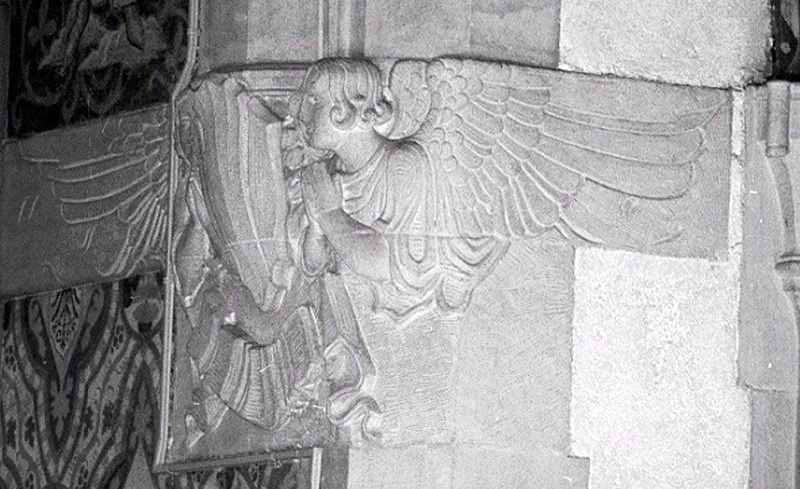 Gabriel is depicted holding a trumpet (“Gabriel blow your horn”). Gabriel is Hebrew for “Man of God”. Uriel – The Archangel Uriel is shown on the lower left hand side of the altar reredos. He is depicted with a torch in hand. Uriel is mentioned in the Apocrypha books considered outside the canonical books of the bible. Michael – The Archangel Michael, the master over the devil, is shown on the upper right hand side of the altar reredos. He is shown with sword in hand. The name Michael means “who is like God”. Raphael – The Archangel Raphael means “God heals”. He is shown on the lower right hand side of the altar reredos. He carries in his hand the pilgrim’s staff. He is an archangel mentioned in the Apocryphal Books, Tobies 123:15, and in the book of Enoch, chapters 20 and 100. In later rabbinical commentaries Raphael appears as the angel who revealed to man the secrets of healing, or medicine. Peter – the crossed keys recall Peter’s confession, and our Lord’s statement regarding the Office of the Keys, which he committed to the Church on Earth. James – the saw is the most common symbol for St. James the Less, treating with his death. At the age of 96, after being pushed from the top of the temple, falling and breaking his legs, he asked God to forgive his enemies. While they stoned him, a fuller severely struck his head with a bat. Then his body was sawed up, providing the symbol used here. Philip – the most common shield for St. Philip is a slender cross and two loaves of bread because of Philip’s remark when Jesus fed the multitude. James Z. – the scallops shell is the symbol of pilgrimage and stands for the apostle’s zeal and missionary spirit. Simon – this apostle is symbolized by a battle ax and an orb. The orb represents his many travels in behalf of spreading the Gospel, and his occupation as a fisherman. The battle ax represents the tradition that he was supposedly martyred by beheading. Thomas – a carpenter’s square and a spear portray this apostle who is said to have built a church with his own hands at Malipur in East India. It is believed that he was stoned, shot down with arrows, and left dying, until a pagan priest ran him through with a spear. 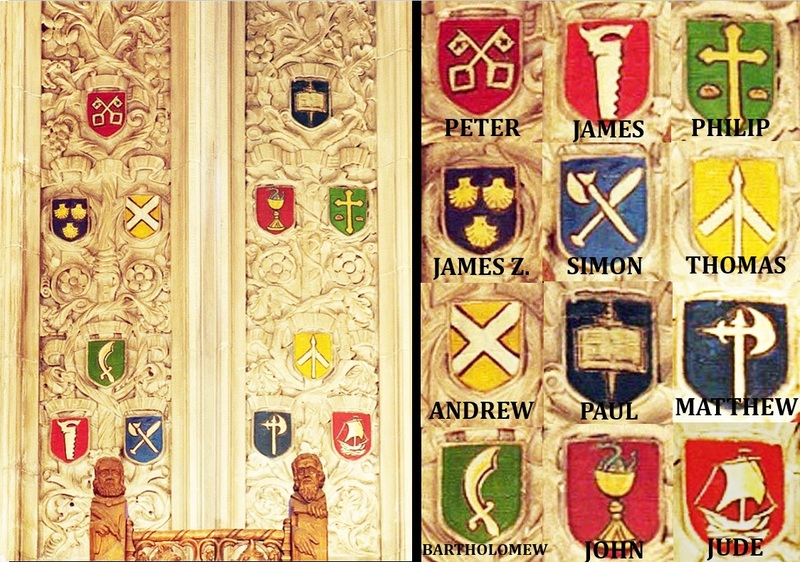 Andrew – the most common symbol of St. Andrew’s is the cross saltier, with its ends reaching the border of the shield. 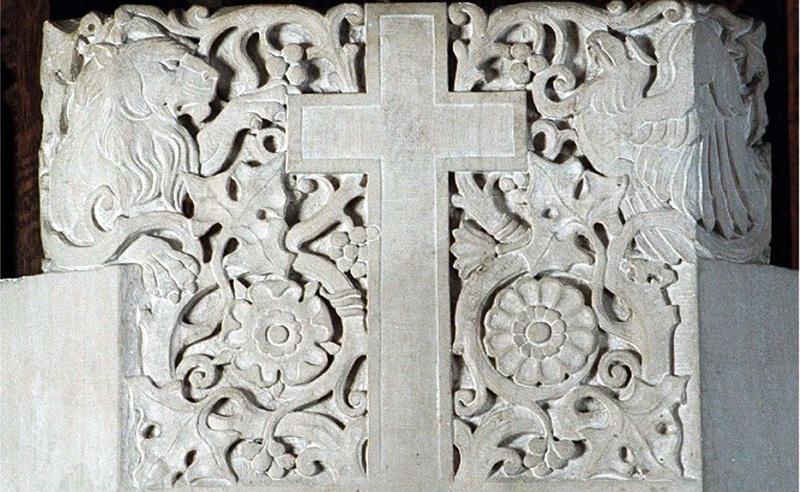 Tradition says that while Andrew was preaching in Greece he was put to death on a cross of this type, requesting that he be crucified unlike his Lord. Paul – while St. Paul was not one of the original 12 Apostles, he did become the foremost missionary of the Gospel. The most common symbol for St. Paul is the open bible with the words Spiritus Gladius, meaning the sword of the Spirit. Matthew – a battle ax symbolizes of the death of St. Matthew. It is said he was crucified upon a Tau cross in Ethiopia, and his head was severed from his body with a battle ax. Bartholomew – a great scimitar is a symbol of the death of St. Bartholomew. Some feel that after he was stoned, flayed, then crucified, his dead body was decapitated with a scimitar. John – it is said that when St. John’s life was threatened by giving him poison in a cup, the Lord spared him from death. Hence we use the symbol of the chalice and the serpent for St. John. Jude – this apostle was a tireless missionary, having visited Arabia, Syria, and Mesopotamia. Therefore, he is represented by a sailboat with a cross shaped mast. 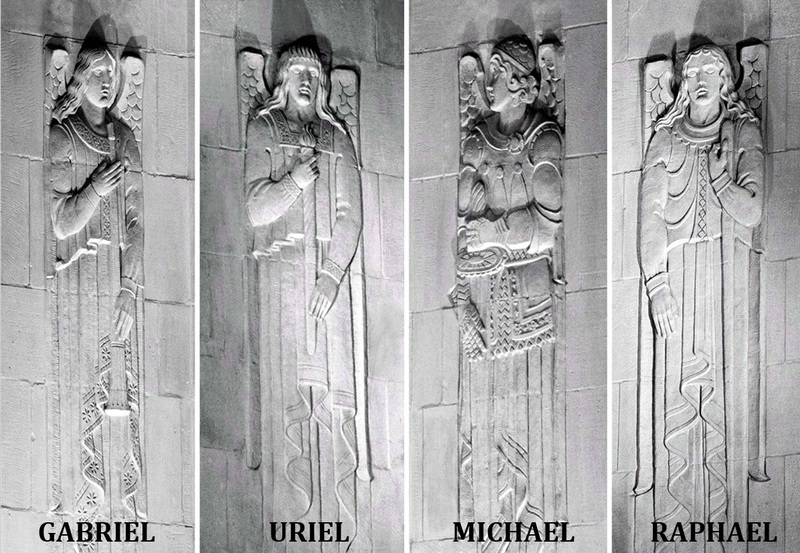 These angels are carved in stone at both sides of the front top arches of the chancel. The Cherubim angels are ranked and are mentioned in Genesis 3:24. 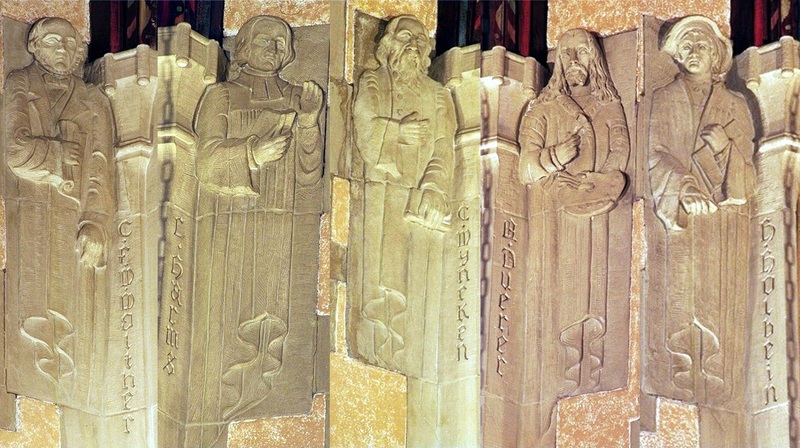 They are prominent in the visions of Ezekiel, and were embellished on the Ark of the Covenant. 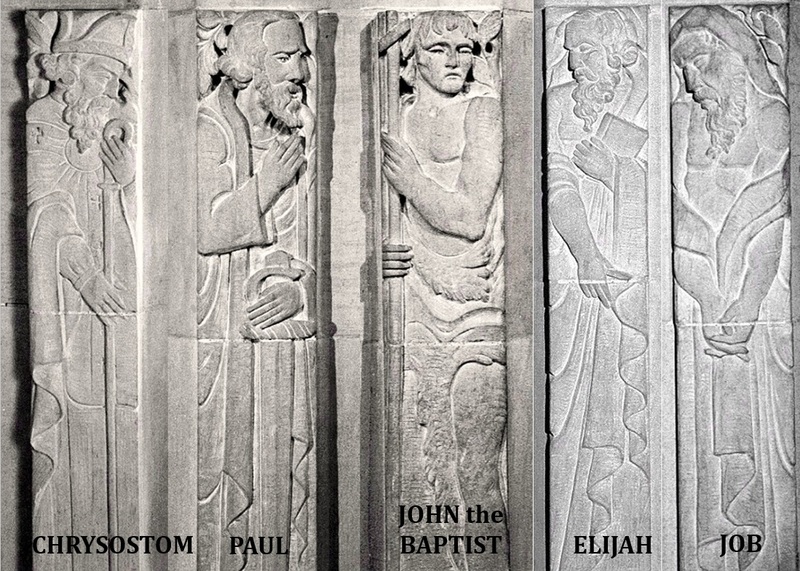 In the visions of John they are part of the choir joining in the new song of the Church Triumphant. The Cherubim are most often depicted as infants or young childbirth in the art of Christian church. Chrysostom – an eloquent father of the early Greek Church, was born at Antioch, Syria about 347 and died at Comana, Cappadocia on September 4, 407. He taught rhetoric by Libanius, a Greek Sophist, who would have made him his assistant had not St. Chrysostom’s religious plans interfered. Paul – the adopted name of Saul, “the apostle of the Gentiles”, was born at Tarsus in Cilicia. He was a Jew of the tribe of Benjamin and a strict Pharisee who inherited Roman citizenship. Saul was educated at Jerusalem under the liberal Rabbi Gamaliel about 36 AD. Elijah – was one of the greatest of the Hebrew prophets. He flourished in the 9th century BC during the reign of Ahab, king of Isreal. On Elijah’s death, the bible records that he was caught up in a chariot of fire to heaven. Job – was the greatest and most widely known man in his part of the world. His story, as written in the book of Job (probably by Moses) is the struggle between God and the Devil over God’s faithful servant, Job. The book outlines the problem of human suffering.